As a dental healthcare staple in the Scottsdale community for more than five decades, Scottsdale Smile Center has a rich and proud history that spans multiple generations of both dentists and patients. Along with our commitment to providing a top-notch quality of dental care alongside an exceptional experience, the shared vision and long-standing collaboration of our doctors and team are what truly set our practice apart from other dental care providers. 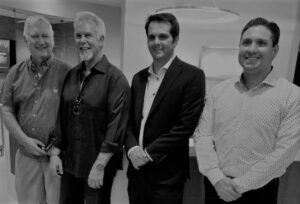 Over the 60+ year history of the practice, this is the lineage of owners, starting with the founder and continuing down to the current owner, Dr. Ryff! 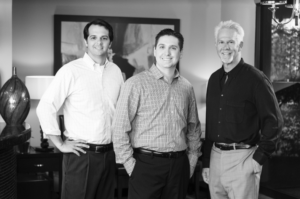 Led by Dr. Brandon Ryff, Dr. Don Chiappetti, and Dr. Jonathan Coombs, our team boasts close to 200 years of collective experience in the field of dentistry. Even more astounding, the combined tenure of our team at Scottsdale Smile Center is over 135 years. In other words, out team not only loves dentistry, but our practice as their ideal workplace. Nowadays, long-standing employee loyalty at one office is, unfortunately, not all that common. Many new patients come to our practice after growing tired of the revolving door of dentists and team at some other offices. At Scottsdale Smile Center, we believe that in order to make for happy, loyal patients, we must first create a positive, rewarding work environment, making for a happy, loyal team of employees. Our talented team is energized and fully devoted to our mission, comprised of three critical elements: patient experience, quality of care, and consistency of care. When patients come to Scottsdale Smile Center, they are greeted and cared for by the same team that has always provided their treatment—no matter how much time has passed between visits. This consistency in personnel not only allows our dentists and team to form strong, lasting relationships with each individual, it gives patients peace of mind knowing they will receive the same high quality of care and level of service they have come to expect at our practice. The enduring cohesion of our team also factors into our ability to offer comprehensive dental treatment at Scottsdale Smile Center. From general and cosmetic dentistry to dental implants and periodontal services, our doctors and team work together to deliver top-of-the-line oral care using only the most advanced technologies and materials. While most procedures are performed under one roof, our team is also well-connected with respected, locally-based doctors and labs in the event a particular aspect of treatment requires the involvement of a specialty provider. These long-standing relationships within the community allow our dentists to effectively coordinate and communicate with specialists to make our team-centered approach as seamless and convenient as possible for you as our patient. Ultimately, we feel the patient experience, quality of care, and consistency of care afforded by our team’s long-term unity make Scottsdale Smile Center one-of-a-kind. We are proud of our heritage, and we are humbled to care for so many patients who have trusted us with their dentistry needs for decades. While dentists and team come and go at other practices, you can feel confident our team will be here for you tomorrow… and every day after that. For more information about our heritage, or if you would like to schedule an appointment with one of our experienced dentists, please feel free to contact Scottsdale Smile Center online or by phone today.